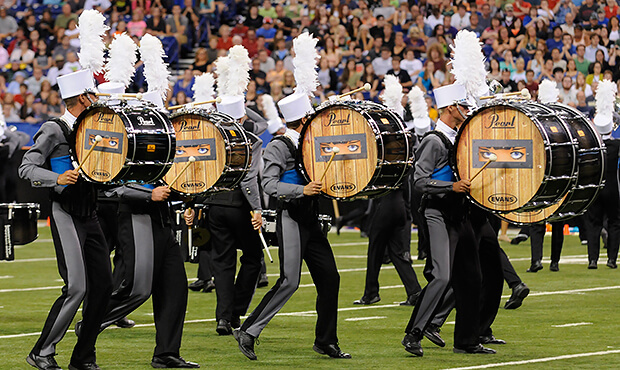 The 2013 Drum Corps International World Championship was perhaps most noted for Carolina Crown becoming the first World Class corps since 1996 to capture a title for the first time. The South Carolina group earned a perfect score in the Brass Performance caption, while also capturing awards for Visual Performance and General Effect. For the sixth year in a row, the Blue Devils took honors for Best Color Guard, while the Madison Scouts celebrated 75 years brotherhood. With its 11th-place "Speakeasy" production, set in the Prohibition years of 1920 to 1933, Spirit of Atlanta taught us that knocking first will literally open doors. The beginning of the show featured a corps member on the field playing "Sweet Georgia Brown" on an old piano prop, simultaneous to someone in the front ensemble playing the actual music, accompanied by the sound of static from a 78-rpm phonograph record. The piano became a common theme, with the corps utilizing seven different piano samples throughout the show, some in tune and some out-of-tune, representing different speakeasies. The piano was interrupted by knocking heard on a door represented by four pairs of cymbals; but it wasn't the correct knock for entry. Another member knocked on the door, also to no avail. It was only when someone who knew the "secret knock" showed up that the door opened to reveal the speakeasy, one of many Prohibition-era establishments that illegally sold liquor. The rhythm of the correct knock was a theme used in every movement during the show except the ballad. Getting things further underway, the corps played the overture from the 1975 musical "Chicago," which was penned by Broadway composer John Kander and based on a 1926 play set during the Prohibition era. Next the corps called upon the George Gershwin tune, "Concerto in F," which the well-known composer had written for piano and orchestra in 1925, following the success of his "Rhapsody in Blue" the year prior. Although he later studied with some of the most famous orchestra composers of the day, he had no formal musical training in composition when he wrote both works, buying and studying books on theory and orchestration. It's one of the great tragedies of American music that Gershwin died in 1937 of a brain tumor at the young age of 38. Ben Bernie and Maceo Pinkard wrote the jazz standard "Sweet Georgia Brown" in 1925, and it has been a longtime favorite for Spirit of Atlanta to perform. During a short mallet percussion version of the tune, members of the corps' brass section lined up to pantomime downing some drinks. In a visual triple entendre, the corps utilized ballet barres as props to represent the bar at a speakeasy. At the end of the upcoming drum solo those same props became the bars of a jail that locked in the Prohibition miscreants. Police sirens wailed and panic ensued, with the raid represented by the drum line intruding on the space of the speakeasy. A percussion feature layered "Interlude and Dance" from Paul Creston's 1944 "Symphony No. 2" upon the jazzy 2010 piano piece, "Songs for Simon," written by New Zealand composer John Psathas. Slowing things down, the corps played "Crazy World" from the 1982 film, "Victor Victoria." The work earned Henry Mancini, who is perhaps best known for his themes to "The Pink Panther" series of movies and the "Peter Gunn" television series, an Academy Award for Best Original Score. Why did Spirit play a ballad in an atypical spot near the end of the show? Show designers commented that the 1920s were complex, and programming a ballad after the prior wackiness was reflective of those crazy times, exemplifying the paradoxes heard in the Leslie Bricusse lyrics, "Crazy world/Full of contradictions …" The corps brought the "Sweet Georgia Brown" theme back for its closer, this time played by the entire horn line. Parts of the secret knock were heard in the front ensemble percussion section, but the correct version didn't come together until corps members directed a warning "shhhh" toward anyone who might accidently spill the beans about the speakeasy. For this week only, you can save on the DVD that contains this complete Spirit of Atlanta performance, along with all of the finalist corps at the 2013 DCI World Championship. Buy the 2013 World Championship DVD set. (Available this week only for 20% off. Regular price: $79.95.) Discount ends Monday, January 26, 2014.